Hori and Miyamura may be worlds apart, but after spending more time together the distance between them is slowly shrinking. Kyouko Hori and Izumi Miyamura are back from their school trip, but have a few more questions about how they really feel about each other than before. Hori gets involved with student council work but gets into some hot water with student council president Sengoku and his girlfriend Remi after a mix-up. Later, after the students are all put into their third year classes, Miyamura reflects upon how satisfying it is to finally have friends who accept him, while Hori wrestles with what she wants to do with her future. As if that wasn’t enough for these two to process, they are both forced to consider what they mean to one another and all of the implications that might lead to. 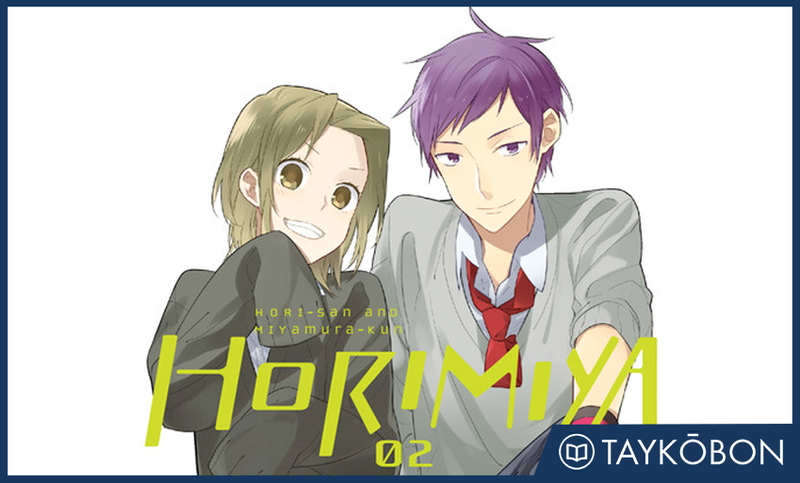 While Horimiya’s first volume focused on Hori and Miyamura’s relationship as they got to know each other, this volume focuses more strongly on the way the actions of their friends impact that relationship. The pair’s friends Tooru and Yuki continue to make an impact, and their school’s student council is introduced as Hori is taken advantage of to get their work done. While these characters each had some funny moments on their own, it was incredibly satisfying to see the way that they provided a nice catalyst for Hori and Miyamura’s development. Satisfyingly, this didn’t feel artificial in the slightest as the impact of these characters each felt like the product of their actions rather than contrivances on the author’s part. An example of this is when Tooru forces Miyamura to really confront how Hori might feel about him because this feels like a natural extension of Tooru’s character. This helped to develop him as well as Miyamura in an interesting manner while moving the plot along. While the surrounding cast does an excellent job helping to move the story along, I enjoyed the relentless focus on developing the main relationship in a well-paced and grounded fashion. Throughout the volume, we get an tangible sense of both Miyamura and Hori’s feelings slowly developing. I enjoyed how natural this felt because these feelings are developed gradually, with none of the sudden epiphanies of love that permeate many romantic stories. Instead, we get an enjoyable build-up of their feelings that proceeds at just the right pace to keep things interesting while making their feelings feel earned and providing depth of character for each of them. This gave an extremely satisfying weight impact to certain scenes because they felt like the natural result of their feelings, selling me completely on their progression. I knew exactly why each of them felt the things that they did and why particular moments were significant to each of them, and this made for a wholly satisfying read that I wish more series would borrow from. Although Miyamura’s development through his interactions with Hori are a joy to watch, a particularly strong chapter centres upon Miyamura’s insecurities about having friends for the first time. We get to see some of Miyamura’s past as he reflects upon how far he has come, and this provides some interesting context for his feelings throughout the series so far. I enjoyed that this chapter was treated with care in the sense that we get a textured look at his feelings rather than an overdramatic explanation meant to quickly explain everything, and I felt that this developed his character in a meaningful and effective way. This also helped cement his development in the series so far, and I appreciated the way this grounded the story in a tangible way. Similarly, Hori also receives a chapter revealing some of her insecurities through a dream, but this is a rare misfire for the series as it was a little difficult to follow what was going on. However, this wasn’t a big issue and still developed her character nicely. A further highlight of this series continues to be the impact that Hori and Miyamura’s friendship has on others. The focus here is primarily on Hori’s little brother Souta, and it was sweet to see how he has slowly grown fonder of Miyamura over time. This leads to an emotional moment where he exclaims how disappointed he would be if Miyamura stopped coming over before questioning if Hori would feel the same way. This brought things full circle, as we see the Hori and Miyamura’s relationship having an effect on others before coming back to make them really question how they feel about each other. This provided some solid development all around, and I felt that this interconnectedness between Hori, Miyamura and the rest of the cast created a wonderful sense of progression. Horimiya’s art continues to be solid, effectively telling this story in a clean and inoffensive manner. Artist Yusuke Hagiwara continues to do a great job drawing each of the characters’ expressions in a way that perfectly nails the emotional subtleties at play, and I thought this complemented the story nicely. The panel layouts are uncluttered and drawings are clean, making up for the relative plainness of the backgrounds. Overall, this volume is a solid effort artistically that conveys the story effectively. Horimiya Vol. 2 continues Hori and Miyamura’s bubbly story excellently, delivering more of the enjoyably subtle yet effective character development that made the first volume so great. This is one of the best romantic series on the market today because of the care it takes in slowly developing each of their feelings, and this volume does a great job in this regard making each moment feel earned. The exploration of the way others begin to impact their relationship did wonders to build their characters, and as Hori and Miyamura grow closer I can’t wait to see what happens next. Horimiya Vol. 2 was published by Yen Press on January 26th, 2016. Authored by Hero and illustrated by Daisuke Hagiwara based on HERO’s original web comic, the series is currently ongoing and published by Square Enix’s GFantasy magazine. Volume 3 will be published in English on April 19th, 2016.